WASHINGTON — President Donald Trump has narrowed his choice to fill the Supreme Court vacancy to three judges and said he expects to make his decision in the coming days. The leading contenders—who all have met with Trump—are William Pryor, Neil Gorsuch and Thomas Hardiman, the person said, speaking anonymously because he was not authorized to speak publicly about internal decisions. 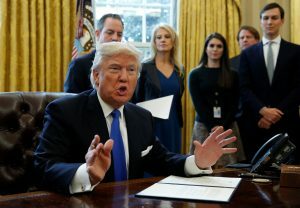 Left: President Donald Trump speaks to reporters while signing executive orders Jan. 24 at the White House in Washington, D.C. He told reporters he would officially name his choice for the Supreme Court vacancy next week. REUTERS/Kevin Lamarque.